Manufacturer of a wide range of products which include automatic post forming machines. 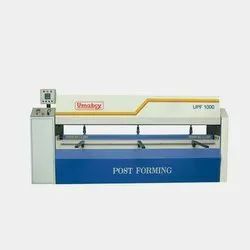 As a customer oriented manufacturer, we would like to present the most advanced Automatic Post Forming Machines to our esteemed customers It is mainly used in woodworking industries in India all across the world. It encloses a PLC Control panel with the capacity of 15 job programs. There is automatic post forming cycle for variable heating time adjustments. It has a pressure clamp with the Soft cotton wrap to grip the job properly cotton for avoiding the job damage. Also, there is a Pneumatic gauge with the cylinder for repetitive job setting. There are 8 pneumatic cylinders that apply uniform pressure on a job for well-organized laminate bonding. The job caring capacity of UPF 1000 is 300 mm to 2440 mm length; 16 to 125 mm thickness 150 mm width. It includes a lifelong heater bar with the maximum 200 ¿¿¿c heating temperature. it also has a drive motor which controls the limit switch. Our machines are best at performance, durability low maintenance cost. PLC control panel which has a capacity of 15 job programs. Special pneumatic gauge is operated by 2 pneumatic cylinders for repetitive jobs settings. 8 pneumatic cylinders to apply uniform pressure on the job through forming heater bar assy. For effective bonding of laminate. Long-life heater bars to ground and hardened. The possibility of laminating more than one small board. Automatic post forming the cycle with variable heating time, stop and go time and holding time can be adjusted to profile. Drive motor with brake is provided to avoid slippage of rotary part. The motion of the heater bar. The mechanical drive controls by the limit switch.